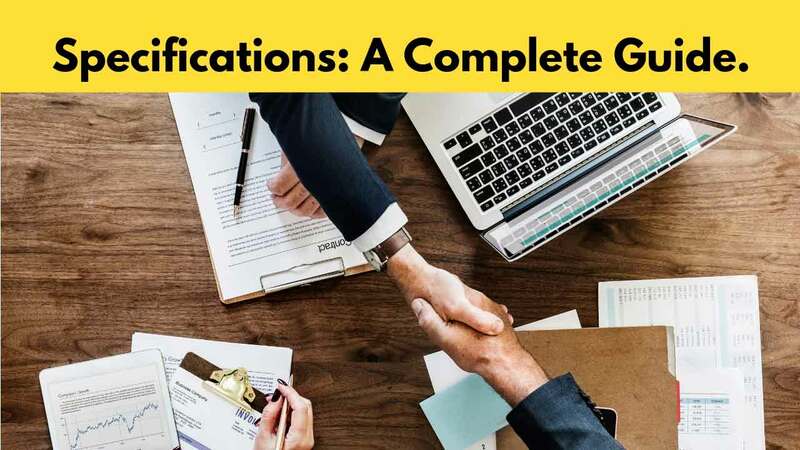 In this article, You are going to learn in details about the Construction Specifications, Types of Specification, its importance, Purpose, Principles, etc. Specifications are made to explain the formation, type, building methodology and strength of the constructional work to represent its quality, i.e., constructional work. These are information which can not be explained through drawings. Specifications are appointed along with drawings for the depiction of project quality. For example, a drawing will represent the size of the door, but it cannot represent certain elementary factors such as door type and timber type, etc. Timber comes in different types with different prices. All these factors are depicted by specifications. Similarly, the ratio of each component of the concrete and characteristics of each component are explained by Specifications because concrete cannot be expressed symbolically. types of fine aggregate used and its characteristics, quantity of the Water, type of the cement and its characteristics, etc. Therefore, all these factors must be explained thoroughly and separately that are known as Specifications. Quantity Survey also heavily depends over the Specifications despite covered area. Drawings are used to express the constructional work or size of the material used in it, but drawings lack to express the material type, the ratio of different materials used, required strength and required color, etc. However, specifications are used for this purpose to fulfill the remaining requirements. Specifications are used for the following objectives. 1. Expressing the quality of constructional material or strength of the constructional work. 2. Expressing the ratio of components used in concrete or mortar. 3. Expressing the type of material such as timber type and bricks type etc. 4. Expressing the color of constructional materials. 5. Listing the conditions of the contract. 6. Evaluating the cost likely to be expended over the constructional work. 7. Explaining the methodology for conducting constructional work. 8. Explaining the machinery and tools used in the constructional work. Read Also:Perspective Projection, Drawing – Its Types, Objectives, Methods. Quality of constructional work is established by the Specifications. Therefore, Specifications must be self-explanatory in meanings. Hence, a very efficient language must be selected for it so that all doubts are removed. Specifications play a vital role in contracts. Contracts have legal values or prestige. Judicial courts can be contacted in case of any conflicts. These conflicts generally rise due to inefficient Specifications. Therefore, the following principles must be observed while writing Specification. A complete description of the constructional material must be included. Type of materials and size must be described completely for this purpose. Despite, the ratio of each component in concrete or mortar and methodology of mixing must also be described minutely. If a material requires certain treatment, then it should also be written in the Specifications. Workmanship must also be described during writing Specifications. Workmanship must describe the method of work, different steps of the work, surface preparation, surface compaction and method of curing, etc. Tools and Plants must also be described during writing specifications in the order they can be organized before commencing the constructional project. It is also imperative to describe that whether Tools and Plants will either be organized by the contractor or by concerned department of the government. Protection of new work must also be described during writing Specifications. It includes protection of digging, ruling, masonry, concrete work, and plastering, etc. Specifications have legal values or prestige hence they must be explained enough to submit its purpose. Small and complete sentences must be used in Specifications. Incomplete and complex words should be avoided, and language with accurate grammar must be used. It must be endeavored to keep the organization of conditions of work as per organization of real constructional work. All these conditions must be practically possible. Clauses of Specifications must neither confer each other not repeated. Watch the video to understand the uses and types of Specifications. There are two types of Specifications as follows. General Specifications are also known as Brief Specifications. They are used to show aspect, standard, and type of constructional work. They would describe the general classifications of the construction work of the project. These specifications are used to establish the standards of the construction work that will help in establishing a Detailed Estimate. Detailed Specifications shows, in the detailed description, characteristics, quantity, ratio and formation method of the material used in construction work. Each component of the constructional work is described in details separately with the help of Detailed Specifications. Therefore, all features establishing standards and quality of the construction work are disclosed. Which will be used later in Detailed Estimate. Detailed Specifications of the items used in ordinary projects are printed that are used for contracts. These Specifications are called Standard Specifications. Detailed Specifications have two major types as follow. This type of Specification of constructional work is written down and published in departments of engineering that will eliminate the need of writing Specifications in details. These Specifications are merely referenced when required. So, these are known as Standard Specifications that are published in the form of books and generals. Whenever tender is required for constructional work, then these Specifications are merely referenced in the tender that will ease the preparation of tender documents. And possible mistakes can be avoided occurred during frequent writing of same Specifications. Standard Specifications have to be written and published by Public Works Department (PWD), Military Engineering Services (MES) and Irrigation Departments. However, other departments can reference Standard Specifications that are organized and published by mentioned departments and organizations. Standard Specifications subject to change as changes and evolution occurs in science and engineering with the passage of time. These changes and evolution must be reflected in Standard Specification to reflect the best practices in work. Some specifications of the construction work are of the special form, and they are not officially written and published in Standard Specifications. These specifications are known as Special Specifications. Special Specifications are written by the in-charge engineer of the constructional project which will usually be a divisional officer (XEN). These specifications are included in tender documents and captioned as Special Specifications. Orthographic Projection, Drawing: A Comprehensive Guide.